The house is approximately 150 sqm. 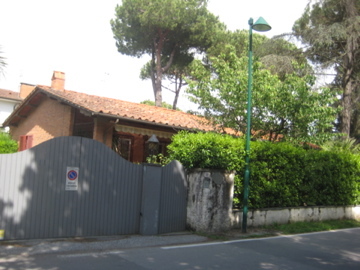 with garden on 4 sides (about 450 sqm), in the heart of Forte dei Marmi. It has two large double bedrooms, both with possibility of extra bed, a bedroom / study with two beds, a new bathroom with hydromassage shower and a small bathroom with shower, large living room with dining area, traditional kitchen with all appliances. Outside there is a patio with garden furniture and a small gazebo. In the garden there are some fruit trees and pines that create beautiful shadows. The house is equipped with an alarm, air conditioning, bars on windows, bullet-proof glass in the living room, and there are two parking spaces and a garage. You can also add a storey to the house and make a tavern in the basement. The distance to the beach is about 800 meters.